UNL has embarked on a new early childhood research partnership with Brazil. UNL faculty involved in the initiative include, back row, from left, Greg Welch, Soo-Young Hong, Lisa Knoche, Christine Marvin and Cody Hollist, and front row, from left, Natalie Williams, Michelle Howell Smith, Susan Sheridan, Kathleen Rudasill and Amanda Witte. Not pictured are Carolyn Pope Edwards, Helen Raikes and Paul Springer. The working meeting drew 60 early childhood scholars, policymakers and educators from Brazil and UNL with the purpose of forming collaborative teams to conduct future research. UNL's representation included the Office of International Engagement, the Chancellor's Office and faculty from the College of Education and Human Sciences. "Learning about early childhood conditions in Latin America opens our vantage point to better understand the breadth and scope of children's needs," said Susan Sheridan, director of the Nebraska Center for Research on Children, Youth, Families and Schools. "This emerging partnership enriches all of us because it allows us to have a new lens on the work we do here in Nebraska." “The UNL-Brazil early childhood meeting was a bilateral summit that places the shared concern for the future of Brazilian and American children on the same critical level as the other vital Nebraska-Brazil collaborations," said Green, who attended the São Paulo meeting. "The Nebraska organizers and participants demonstrated that we remain committed to Brazil for the long haul despite temporary economic challenges." Building relationships was a critical component of the trip, Sheridan said, as participants exchanged perspectives and began forming ideas for future projects. Collaborative UNL-Brazilian teams will have the opportunity to apply for project funding from the UNL Chancellor's Office, with the intention of positioning their research for larger grants. Potential projects include those focused on social-emotional interventions for young children in Brazil, evaluation of Brazilian home visitation programs, and in-service teacher training to support young children's language development. "We saw an incredible energy and commitment to working together across countries and cultures," Sheridan said. "Through this process, teams began to co-create meaningful directions that are already taking shape." Williams is collaborating with Pompéia Villachan-Lyra, professor at Brazil's Federal Rural University of Pernambuco, and UNL's Christine Marvin and Cody Hollist to identify strengths and key stressors for Brazilian families and early childhood educators affected by the outbreak. The team is also considering how their research could support early intervention programs in the United States. "This meeting drew so many people from different interest areas who are ready to roll up their sleeves, dive in and tackle really big issues facing Brazil – and in many ways, facing the United States, too," Williams said. "It makes you think about your research on a much larger scale." 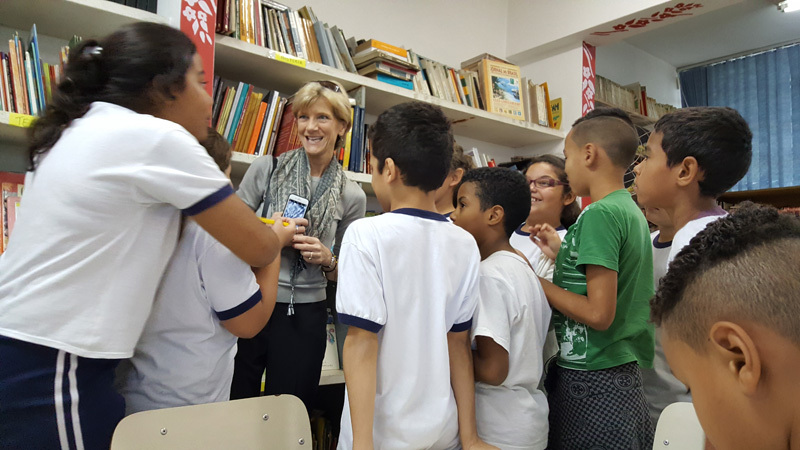 Susan Sheridan visits a school in Sao Paulo, Brazil, on a trip marking the start of a new UNL-Brazil early childhood research partnership. Sheridan and other UNL faculty members visited schools and child care centers prior to the UNL-Brazil working meeting May 18-19.